The Merriam-Webster dictionary defines sedition as follows: incitement of resistance to or insurrection against lawful authority. John Kerry and the Obama shadow government seem to have once again, crossed that line. “Ma’ariv reported that former US Secretary of State John Kerry met in London with a close associate of Palestinian Authority President Mahmoud Abbas, Hussein Agha, for a long and open conversation about a variety of topics. Agha apparently reported details of the conversation to senior PA officials in Ramallah. A senior PA official confirmed to Ma’ariv that the meeting took place,” wrote the Jerusalem Post. The paper goes out to outline how John Kerry seditiously plotted against the Trump administration and their efforts in the Middle East. It should be remembered that Donald Trump is the president of the United States, the duly-elected leader of the United States. John Kerry is not. The Jerusalem Post goes on, “Kerry asked Agha to convey a message to Abbas and ask him to “hold on and be strong.” Tell him, he told Agha, “that he should stay strong in his spirit and play for time, that he will not break and will not yield to President Trump’s demands.” According to Kerry, Trump will not remain in office for a long time. It was reported that within a year there was a good chance that Trump would not be in the White House. 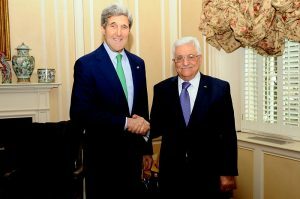 “Kerry offered his help to the Palestinians in an effort to advance the peace process and recommended that Abbas present his own peace plan. “Maybe it is time for the Palestinians to define their peace principles and present a positive plan,” Kerry suggested. He promised to use all his contacts and all his abilities to get support for such a plan. He asked Abbas, through Agha, not to attack the US or the Trump administration, but to concentrate on personal attacks on Trump himself, whom Kerry says is solely and directly responsible for the situation. With all of the information coming out of the FBI and the DOJ on the illegal scheming against the Trump administration, it seems John Kerry is in on the plot as he tells the leaders of terrorist groups that Trump will be out of office in a year. The definition of treason is as follows: the betrayal of one’s own country by waging war against it or by consciously or purposely acting to aid its enemies. John Kerry and the Deep State have once again crossed that line. Russian Paratroopers Celebrate Paratroopers Day…And Do What? What Is Happening To Poland’s Military?